When I started this blog years ago, I thought it would be the voice of dudes everywhere. Roughly 92% of my followers are women. Roughly the same percentage of male bloggers write like women. I feel like I write for women. Not like. Big difference. I won’t say things like squee! or totes adorbs or “said no one ever.” I think those aren’t manly terms. My No. 1 fan in terms of comment engagement happens to be a bloke. Or a mate, as it were. Laurie, who writes The Adventure of Writing, is nearly the first to check in to my posts. When I hit publish at midnight, it’s 7 p.m. down under. Just as I drift off to sleep, my phone chimes in that Laurie Smith has liked my post. Today, you’ll like his post. My Englishman friend turned Aussie will tell you today the five essentials he’d bring to a barbecue with Coach Daddy. While we fire up the barbie, make sure you check out his Adventure of Writing, wrought with tales of curious wallabies and wayward spirits. I’m pleased to be here on Eli’s blog and would love to attend a BBQ at his home. After I finish listing what I’d bring he may not invite me back though. This shows that I actually do work around the place now and then. I don’t go outside unless my old hat comes along. It not only keeps the sun off my balding dome in summer, it keeps it warm in winter. I can use it to put out small fires, especially those that flare up on a grill. Flies don’t know what hit them when you swish it around, and you can wear it down over your face when you’re sleeping relaxing. 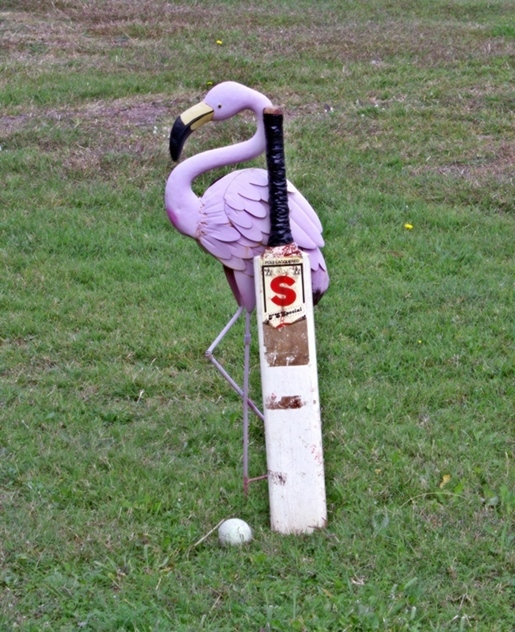 You don’t have to use a Flamingo for the wickets but it does add style. Yes, Skippy does get eaten here. and it tastes like, err chicken. It wouldn’t be a BBQ without that favourite, kangaroo, the other half of the emblem. No, it doesn’t taste like chicken, more along the line of venison, slightly gamey but highly nutritious. I would have to bring a six pack of Fourex Gold, yes it’s a beer. I know the brand Forex in the US is a condom; it caused no end of mirth in Vietnam when you told a US serviceman you drank Fourex. It is a beer to behold and there’s nothing like feeling it sliding down your parched throat on a hot day. It helps wash that croc meat down when you find out exactly what you’re eating. 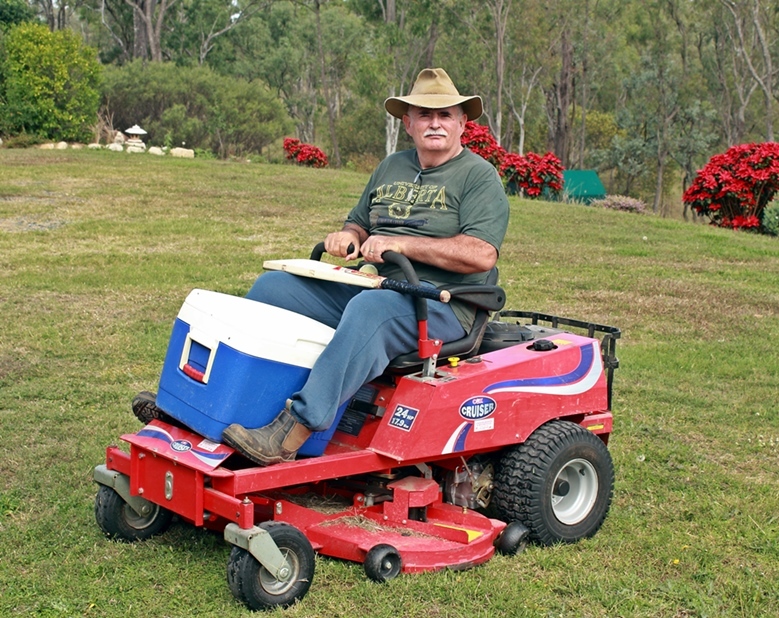 A Zero Turn Mower to carry my Esky. I’m on the way; will someone point me in the right direction? One has to think ahead here. What if your lawn hasn’t been cut? I’m dressed for action, wearing my hat of course, bat ball and an Esky full of meat and beer. So watch out Eli, when you hear that four stroke engine screaming in the distance, and the rattling of empty cans you know Laurie is on his way to your BBQ. Something a little different here folks. Eli form Coach Daddy invited me to write about the five things I’d take to his BBQ. So pop over for a look and a lovely new picture of yours truly. Thanks so much Eli, it will give the followers a different view of yours truly. Sorry about waking you up Mate, you’ll have to change your ring tone to Waltzing Matilda or something so you know it’s me. I wanted them to know the mate behind all the comment convo around here. 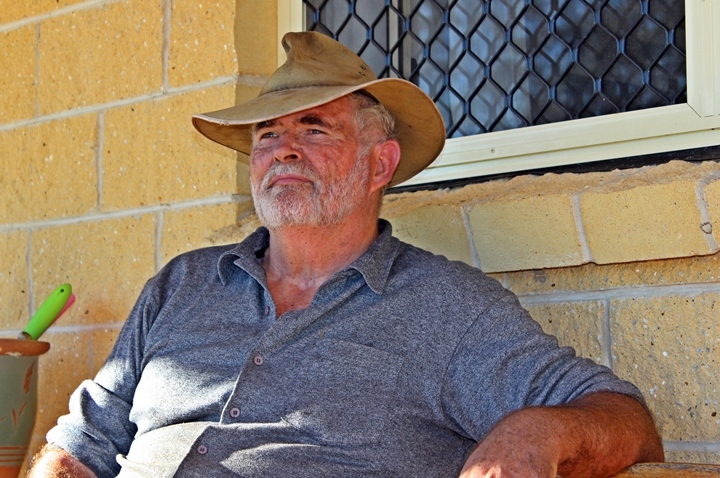 Waltzing Matilda – my kids used to sing that. I’m so much more worldly than I thought. And yeah, then I can sleep soundly knowing you liked the post and are lifting a Fourex in my honor. The beer, mate, the beer. Yeah we get carried away on the conversations at times and that’s a good thing. You are worldly Mate. It’s all about the beer Eli. I even drank an El Presidente in Dominican Republic, mate. Tasted just like Coors. I’ve tried a few beers, from Beer 33 in Vietnam which tastes like water buffalo pee to Colt 45 and Schlitz. There are some beers out here now that taste like angels crying on your tongue. wait, how do you know about buffalo pee taste? Thanks Suz, I’ll probably have a better chance of reaching your place on my mower than Eli’s. It would be an adventure in writing, even. Suz, sounds like you have it down to an art! Just fake it til you make it, Sooz. Depends on how long you can hold your breath underwater, mate. I have a big snorkel Mate. That’s what she said, mate. It would be quite the blowout. It would and I wouldn’t drink and mow I’d probably run over myself. the yard could use a trim while you’re here. What a feelgood post! Of course I’ve seen you around, Laurie, and noticed that you benefit from the head start that living in Australia brings 😉 Love your national anthem and what little I’ve seen from your beautiful country! Now to the barbie: Bringing your hat will be the beginning of a wonderful friendship. I’m sure you’ve heard about Eli’s Rockies cap. Too bad I don’t work for the airline anymore. I would have loved to arrange for a ticket for you to actually make that BBQ happen, lawn mower, cricket equipment, croc meat and all – that’d be such a blast even for us readers! 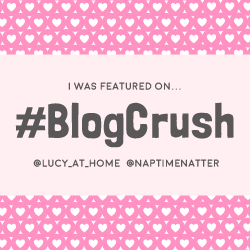 You WOULD blog about it, right? To E: what took you so long to feature your mate? Just saying. Thanks for the fun! And ‘squee’ is a noise some mama bloggers make when they like something a lot. Hi Tamara, I don’t always do feel good but Eli gave me a great opportunity to give it a go. Waking up when everyone else is going to sleep has it’s benefits. With a big hat one can get that all round protection. I’ve heard of Eli’s Rockies cap, I actually have a Green bay Packers one somewhere in the cupboard. That would have been a sight Tamara, me zooming out of the luggage compartment on the mower, waving my cricket bat in the air. Yes I would blog about something as momentous as that, ‘Expat Englishman brings new culture to the Americas via Oz.’ Thanks so much for dropping in Tamara. You ought to check out Tamara’s blog, mate. I will Mate, when I’ve caught up with the BBQ. That’d make you traveller of the year at JFK airport, hahaha! It’d be all fine and dandy until you picked up your esky from the bulk items belt and arrived at customs, and the humorless officers took away your croc. No importing of prospective purses! And don’t get them started on the meat. Not even canned! I almost got arrested for having an apple in my backpack once. True story. I thought LAX was bad. They never look on the bright side of things at airport security. No croc purses, how would I go with my cane toad coin purse? I imagine that fresh meat is not popular, the same here actually. An apple eh? You should have told them you were Johnny Appleseed’s little sister. 🙂 It was so nice to meet you at the BBQ today Tamara. That should be a blog post, Tamara. Sounds like fun Fratello, can you little sister come along? You look like you are ready to have some fun. :o) Great post. The party doesn’t stop until Fratello gets there, Patricia. Sorella, what can I say? Of course you can, the more the merrier as long as you bring one of your dishes, full of course. Yes it’s nice to play in Eli’s blog, plenty of happy people. There are a lot of happy people here, aren’t there? There surely are, I think they’ve all been tucking into a few drinks of choice while I’ve been away. “We come from the Land Down Under” …. You two keep on singing, I’ll check the roo steaks. Medium rare on mine, please. 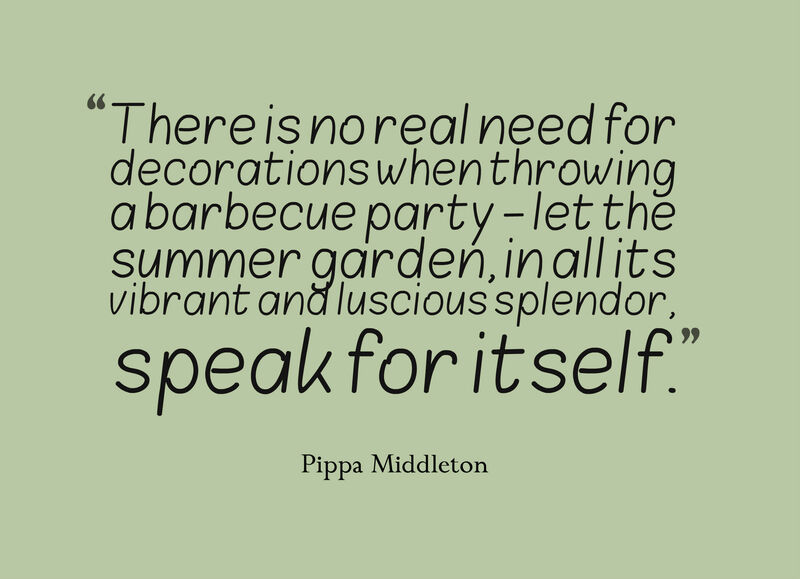 Love the quote from Pippa Middlleton. I just love Pippa Middleton. LOL! *Note to self: Make sure beverages have been swallowed before reading Laurie’s humour posts”. Great job, Laurie and loved the photos! Nice to “meet” you, Coach Daddy! PS- Would that work t-shirt be a nod to my homeland, Laurie? Or is there an Alberta in Aus too? Great to meet you too Tami – I’ll be sure to check out your blog, despite the company you keep online! Have you been snorking out of your nose AGAIN Tami? It can be undignified you know. Great to see you here, Coach Daddy is nice people and he always has something happening here. That is an Alberta shirt, I bought when I was in Edmonton in 2002, went there for Xmas in 2003 too. Never had an esky on the pages until now, though, mate. It’s definitely an Australian name. The Kiwis call it a Chilly Bin. We just went with the brand name of Esky, much easier. Would you eat a kangaroo burger, Janine? At least a slider, Janine. Thanks for dropping in on the ‘Barbie’ Janine. If you like steak, you’ll like Roo steaks. Oh and you’re welcome to give my mower a run too. Janine is on board for a roo slider at least, Laur. Nobody wants to sit on my knee for a mower ride Mate. I don’t know why at all. With cheese and hot sauce, I’m game, Carrie. Hi Carrie, glad to have brightened your day. After a few Fourex’s and a plate or two of fine food we’d be sitting back telling the kids how to play. Only after hitting a couple of sixes over the roof. To be really confusing, that’s if the rules aren’t confusing enough it can bee called both. We Americans are going to want to six all the sixes we can, brother. Whatever that is. Well Eli, it’s like this. You hit the ball and run between wickets, if the ball hits the boundary it’s 4 runs. If it goes over the fence it’s 6 runs. You need to fire up the old computer and have a look on you tube, there’s bound to be a game on there. All I know is the Indian blokes who play at the park have to look out for my wayward throws on the disc golf course, and I have to watch out for their wicket balls flying into the brush when I toss the discs. So excited to see Laurie on here! I love the banter between the two of you. Hope that’s not creepy that I read it… If it is, ignore that line. Cricket – I’d definitely give it a try. I’m pretty good at softball. The grub – I think I might be able to lose some weight there… or gain it because all I will eat is the junk food. The transportation – If there’s room for a cooler then there’s room to take me for a ride, right?! Sometimes, our banter goes on after a new post has gone up … it just has to run it’s course. Hi Cheryl, yes Eli and I chat away as if no one is watching. Not creepy at all. In the top picture they swoon from the sweat and chainsaw dust. They swoon when I wear it a rakish angle though. Food? Okay I brought chocolate, it’s swishing around in the slurry at the bottom of the esky. Beer? I’m sure there’s a wine spritzer in there somewhere. This could be true Cheryl, I’ve been known to feel a little flirtatious after a couple of ales. What happens at a Coach Daddy barbecue stays at a Coach Daddy barbecue. It would have to stay there Mate. Actually I’m a gentleman, I just channel Errol Flynn after six cans. It takes 1.5 cans for me. They called me Easy E in my youth, mate. I feel a snork coming on! You eat kangaroos and emus? It is indeed Mate. There are millions of roos in this country more than when Captain Cook sailed up the east coast. With the emu’s they only use the farmed ones. In the U.S., we’d want them to be free-range too. Farmed are better Mate, with the free range ones you have to be an Olympic sprinter to catch them. Just go for the feet, that’s what they say. The bloody things have got big feet, three toes and they can kick the crap out of you. They only look stupid. sounds like a raiders fan. Yes Gigi we do. Although the ones that visit here are safe. There is an emu farm about 20 minutes away where they breed them for the meat industry. Tastes just like chicken, right mate? Believe me, they are. I wouldn’t BS to you. Laurie, I always enjoy your comments and now I’m enjoying your post. I had no idea that Pippa Middleton had quotable quotes, but I consider myself schooled on that and I may make this into a magnet. I don’t know if I could eat kangaroo, though. I have wildly unpopular rules on eating meat/seafood. It can’t look like it did when it was alive. It can’t be an adorable animal. And it can’t be an animal I love. So goodbye lobster, lamb, kangaroo, moose and whale burgers! That settles it: Table for three at the the Ugly Animals Diner, please. A booth, if you have it. Give the tab to the bloke in the cool hat. Mate! That’s why I wear a hat so I can pull it down a bit and sneak out of the restaurant. I forgot you have the paparazzi to consider. I will have to watch out after today’s post Mate. What a great response, I enjoyed it. It was a pretty good party, wasn’t it? It was tops Mate. I had a great time, really. Loved every minute of it. I’m glad we finally made it happen, Laur. Too good to miss Mate. A great time was had by all, and I made some new friends. What more could you ask for? Tamara, Me too! I’m glad I’m not alone. And, btw, I think shrimp look like fleas. Shrimp are jump fleas, maybe. I always thought they were little aliens! I tried eating one once. It didn’t work out. Did you set them free like on Fish Tales? Shrimp/Prawns are basically cockroaches of the sea, only they look much better than the ones on land. 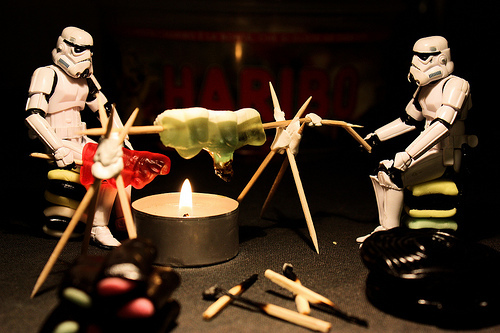 They taste delicious in a curry (no, not roaches) or BBQ’ed or, or……. Anyway you can cook them Joy. After these comments, I’m not as keen on shrimp as I was, say, two days ago. Oh my, that’s not good at all Mate. When you see them on the grill you’ll forget what I wrote…. eventually. I feel your pain Tamara, although I reckon you’d starve in China, they eat some strange things there. I used to hunt years ago (I take pics now) and I had a hobby farm for a few years, so I slaughtered my own food. I did however always thank the animal for sustaining me. Not that it stopped it from dying I guess but I felt a little better. I have no trouble with seafood, they’ll eat you if you stay in the water long enough. Whales are out only because I haven’t got an esky big enough. Kidding, although I guess if that’s all you had to live on it would be different. You didn’t mention Rabbits, now there’s a tasty little critter. They’re an introduced species here and quite a pest, so rabbit pie, stew, casserole etc are quite a fave dish. I just envisage an ugly mask on them then I feel better. Thanks for commenting Tamara, it’s been a pleasure chatting. I don’t think Tamara will eat anything with eyes for the next 17 years, except potatoes, mate. you’re going to love his blog, beth. Thanks for following Beth, I saw that you ‘joined up’ this morning. I’ve been that busy I haven’t had time to come on over. Eli’s had me cleaning his BBQ, actually I’m still trying to explain the intricacies of cricket to him. I just want to bash the ball over the fence. Laurie, Love the hat! You and the hat look like the real deal!! It’s Ernest Hemingway meets Indiana Jones. Hmmm, how about Indiana Hemingway? it has a certain ring to it. Sounds like a pretty decent pen name, mate. I was thinking of JK Rowling but that’ been taken. Thanks Joy, it kind of adds some credibility….. I need all I can get. Here’s another GREAT Laurie-post just as I love them. Love the pictures too of course!! What would a Laurie post be without the art, Raani? Still awesome, but still. But she loves Moose, mate, so probably a Water Buffalo will be totes adorbs to her. I think you did, Mate. you’ll be putting smiley faces up next. that’s just a mistake or two from rooting for the dodgers, mate. no thanks. Stand fast, don’t let them change you. Hey Raani, you’re just in time for a quick spin on the mower. We’ve eaten all the food, drank everything and I’m picking teams for the cricket. You can be the leg umpire and I’ll be in the ‘silly mid off’ position.’ I try with the pictures Raani but it’s funny, nobody has mentioned the pit full of crocs. Hmm. The crocs were delicious, mate. Especially with a little butter and Old Bay seasoning. Your BBQ sounds like a grand ole time, Laurie! It’s nice to see you featured here on Coach Daddy. I’m headed over to check out your blog now. Before I go, wanted to ask you if you know Greg Anderson, the electric cowboy and/or Price & McCoy. Had the pleasure of working with all three of them several years back. Nice guys who represent Australia well. Laurie’s the life of the party, and he cleans up well, too. Jennifer, what can I say, I missed seeing your post here. Sorry, I don’t know the gentlemen. I hope you didn’t think I was ignoring you. No kangaroo for me, thank you. I’ll take the beer though. Enough beers, and you won’t notice the roo! Especially this Australian stuff. Aaaah, I brought it specially too. This is fantastic! I love the cricket rules and using the little brother as a stump! I don’t know about emu and kangaroo, even though I love venison and I imagine the croc tastes a lot like gator, which I’m used to. I love this post from top to bottom, Laurie and Eli. I’m still recovering from this party, Sandy. 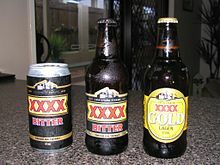 Australian beer is for real. Hi Sandy, sorry I missed you. I didn’t tick the notify box, I should’ve known with Eli being so popular that there’s be more comments. Roo’s pretty much like venison and croc, well like gator I guess. I’m very happy you liked this post Sandy, it was a hoot doing it. I have actually had crocodile……or, was it alligator? well whichever, it actually tasted quite good. I don’t know that I could eat Skippy though. Besides, he looks like he could beat the crap out of me before I could take him out. Maybe that’s too touristy, Rore. Croc, gator, it’s all the same – only the sauce changes. I accidentally ate alligator and found it dry. Skippy, with a little Old Bay and tenderizer, on a tortilla, I’ll give it a go. You just need Laur to wrestle him to the ground first. I’ll do that as soon as I find my box and helmet. Fosters??? Aarghhh, it has to be fourex Rory. Yeah those big old skippys would give you a run for your money barehanded. Laur makes all us blokes look bad, Jenn. I try Mate, I try. Thanks Jen, I’ll take that one as a compliment. Hats like this have to be moulded and nurtured you know.